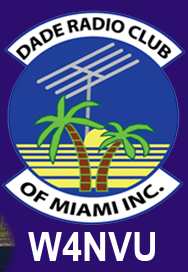 October 2010 Meeting Minutes – W4NVU – Dade Radio Club of Miami Inc.
Meeting was called to order at 19:58 with 30 present. Ernesto presided over the meeting and welcomed everyone. The meeting was broadcast live on the air tonight from the EOC. Testing is being done in the other room. The microphone was passed around the room and everyone took turns and stated their name and call sign. Ernesto welcomed everyone again. We have a quorum. We do not have a guest speaker tonight, but will have 2 presentations after the meeting by Ray and Hollis. Ernesto reminded everyone present tonight to sign in. The September Minutes were not posted. Will approve at the next meeting. Robert spoke about the 220.000. It is at his house looking for a home. Ray spoke about the 145.760. Everything’s working. We’re on it now. Please use it. Carl spoke about the 444.200. It’s operating well. People are using it more and more. He has been speaking to St. Lucie and Stuart lately. We now have an accurate membership roll. Quite a few members have not paid dues and are not active members. If members do not pay, they will be dropped from the membership list. Glenn asked what happens if you are dropped off the membership roll. Ernesto explained that you cannot vote at any of the meetings or vote for officers. The dues support the club and the repeaters, equipment, insurance when we have events, etc. Sam made a motion that anyone who pays their dues tonight will be good through 2011, seconded by Victor. A vote was taken and the motion passed. You can pay your dues tonight or mail them to: Dade Radio Club of Miami, PO Box 452253, Miami, FL 33245. It is $30.00 for membership and an additional $5.00 for each family member. It was discussed that there are benefits to broadcasting our meetings on the air. However, if anything is considered of sensitive in nature, the meeting will not transmit live over the air but will be for club members that attend the meetings only. If the Dade Radio Club takes all of the above equipment, the South Florida Council/Boy Scouts of America expects the Dade Radio Club to be at the Scout Show EVERY year to do a communication booth for the scouts to show them the “good old days” and to be at the Merit Badge College. The Scout Show will be at the Marlin’s stadium and the Merit Badge College is at different location. After discussion by the members, Sam made a motion for the Dade Radio Club to accept the equipment from the South Florida Council/Boy Scouts of America and for the Dade Radio Club to commit to attend both the Scout Show and the Merit Badge College, seconded by Dave. After further discussion, a vote was taken and the motion passed. Sam will make arrangements with Carl. Ray wanted to know where we were going to store the equipment. Carl said it would fit at the EOC radio room. We could also use it at field day and add it as a go package. Ray also suggested that we lend it to any school teachers that teach ham radio to use it. Ray also suggested that Sam ask the Boy Scouts if they have an interest in having a ham station at their headquarters building in Miami Lakes. Sam will ask them if they have space and if they want to set it up. Hollis asked if someone can abstain from voting when a vote is taken. Ernesto advised that a vote is taken from the majority present. It would not matter. Hollis then spoke about the ARRL voting coming up and the ballots received in the mail and if anyone was going to vote. Carl also spoke about the upcoming ARRL voting. Everyone was encouraged to vote. Ernesto also advised that it is a good idea to join ARRL. They are our only lobbing system. Dave came into the room and announced that Miguel Garate just passed his Tech. Congratulations Miguel. George asked if he will automatically be put on the mailing list. Ernesto said that nothing happens automatically. Carl said that we need to look into the website and get someone to do it. He was asked if he was volunteering and he said no, he did not have the time. Robert is back. He is going to try to put on a smaller version of the hamfest. He just came back from Melbourne. He was thinking about a $10.00 – $15.00 show with a tailgate area. Ernesto it’s a great idea but that we need to know first how much it would cost us. Carl suggested a small swap area in a restaurant parking lot. He suggested that a small committee be put together. The number 1 expense is the cost of the place. It is going to be hard to find some place for free and not paying thousands of dollars. It was suggested that the Polish/American Club or the German/American Club has cheap rates. George made a suggestion West on Krome at SW 8th Street. He will get a price and let us know at the next meeting. Glenn asked if we ever considered a site with some other function like a family deal. Robert said that at one time he tried and the other party did not want to work with us. Carl said that at one hamboree, there were buses to take the children and other family members to Tropical Park and back. Ernesto asked if anyone besides Robert would like to be on the committee. Carl, Glenn and Kevin all volunteered. Ernesto then spoke about the ARRL field day in the middle of summer. He suggested that we have a winter field day and reach out to some other clubs in Ft. Lauderdale. Carl will contact Palm Beach and Broward people and see if they are interested and will report back at the next meeting. Robert suggested AD Doug Burns Park. They have cabins and rent out to organizations only. We might get to swing a discount rate. Ernesto stated that SFFMA had a picnic/BBQ that also brought in new members. Carl suggested a small committee be set up and that they do a scouting trip. He is also going to check with Tropical Park near the horse ring and see what the fees are and what dates are available. Others advised of other field day places. Hollis asked what the new building to the south of us was. It is the new fire training center. Felipe advised of the Kayak race this Saturday starting at 7:00 AM at Matheson Hammock Park. He needs volunteers. Ray brought up the ING race with Ben Nemsner for January 30. He needs volunteers. Kevin asked if we were a 501 C. Not any more. He said that there are new rules that you must file something or you lose it. Ernesto asked if there was any other business. With no other business, Ernesto thanked everyone for coming. A Motion to close the meeting was made by Victor, seconded by Randy. Voted and passed. The DRC meeting was adjourned at 20:47 and the meeting was taken off the air. Presentations by Ray of Mobil Digital TV and Hollis on tubes were given to the members present.